I am so excited to be able to offer the next block in this Block of the Month Series: Midnight Posies. This second block is "Rosey Posey Churn Dash." Again the block is simple but the colors are dramatic. Bright colors against the black background really make this pieced flower block glow. Please let me know what you think of this block, and the super simple directions for this quilt. After the BOM is over I plan to publish this pattern and your feedback will be very helpful. I wanted to make an easy quilt that a beginner would enjoy, that doesn't look like a beginner quilt. The bold fabric, floral theme, and simple border with fusible applique makes this quilt look so much more challenging than it actually is. That is the concept that drives all my patterns. I hope you enjoy making this quilt as much as I enjoyed designing and teaching it. This weekend I took down the one-woman quilt exhibit -- Flowers in Fabric --I had the good fortune to display at the art gallery at the college where I work. Our Winter Faculty Art Show gave me the opportunity to display 70 of my quilts for more than a month. What a thrill it was, to see so many of my oh-so-special creative project all hanging together for the first time. While I have displayed quilts in shows many times, this was the first time I was responsible for an entire exhibit, and discovered the fun of creating a "display" of quilts which revealed not only the variety of pieces in the exhibit, but the play of one quilt upon the other, and the impact that had on the visitor. For example, as a visitor entered the show, this was one of the first quilts they saw, from across the room. The movement and flow of color immediately attracted the eye and invited them into the exhibit. The walls of the gallery were lined with quits, which flowed one into the next by means of color, theme, or pattern. Each quilt was accompanied by a label with a detailed story about the quilt, the maker(s) or the pattern, further inviting the visitor to stay and linger and enjoy. All this was a revelation to me, and part of what made creating the exhibit exciting and new. Each quilt evoked a special memory I wanted to share with the viewers, offering them a glimpse into my creative world, and a spark to ignite their own creative inspirations. 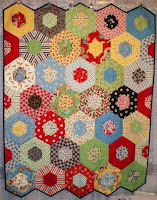 This quilt is a round robin complete by a group of quilters who participate in an online quilt group I moderate. I call it Fried Egg Flowers. I just love the whimsy, color and beautiful craftsmanship they each put into this quilt. This quilt is a tribute to our friendship, but also to the shared creative delight we generate each time we work on one another's projects. This quilt normally hangs over my desk in my office and students come in to talk about classwork and find themselves staring into the face of a rose in full bloom. They always ask if I made it. I smile, and tell them "yes," laughing a bit to myself as it always reminds me how we under-estimate people, and it keeps me patient and humble as I work with students and answer their questions. In additional to showcasing my own quilts and those I have shared with members of my various quilt groups, this exhibit also gave me an opportunity to showcase my original patterns. The gold and green quilt features the December flowers of the Month -- Holly and Poinsettia. The red flowers are carnations celebrating the month of January against a snowy background. This quilt celebrates the contrast of the breath of life dormant in the long cold winters with the astonishing beauty of the January flower -- the Red Carnation. The water lily, or lotus, the ancient flower of the month of July, floats in the turquoise pond bounded by sea blue waters. I love the play of colors in the water, random and varied, contrasted with the stylized symmetry of the lotus. 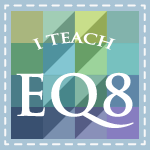 As a result of this show, I have been asked to teach quilting lessons to our students through our extension office. What fun! I have also been invited to exhibit my quilts again in April at the Public Library as well as teach several quilt classes there. It has been delightful to let my academic colleagues see a side of me they never imagined existed. . . all because of my passion for color and fabric. You can see the whole quilt show here. I hope you enjoy the walk through the gallery, wandering through the garden paths, and strolling amid the flowers. Thanks for taking a look. I started a new embroidery quilt project recently and really enjoyed making these blocks. My sister grows and uses herbs and I found these vintage herb patterns on the web some months ago. I just loved the way the words were woven into the pictures. I work on them at guild meetings and doctors offices as a take-along project. Yesterday we had a teacher in-service at school and I took them along to keep my hands busy while I listened (well sort of) to the speakers. Here is thyme with its pretty little purple flowers. Marjoram is a very old herb that is not used much lately. But I loved the shape of the leaves. The dill leaves are really accurate, I think. Reminds me of the plants in my sister's garden. The flowers are a bit light, though. I think I may take those out and use a darker shade of yellow. The chives are fun. The blooms are as I remember them from my own gardening days. The variegated green thread is a bit light in this block, but I think I will leave it. What do you think? I started the word in the Parsley block, then remembered I wanted to change colors for the word. I will have to go back and take out the loop on the "P" and change it to blue at some point, I think. But I love the shape of the leaves. I just started on the Sage block, and it is a real challenge. I chose the striped background to go with a very pale delicate victorian floral in shades of rust and gray greens. It goes perfectly with the accompanying fabrics and has that vintage look I love so much. I have been using Weeks Dye Works Over Dyed Fibers for the thread, and it is lovely with its slightly variegated colors. I only have 8 herb designs and I need 12 for the quilt, so I bought a book of herb drawings from Dover books and will make 4 more myself, duplicating the script style woven into the pictures. I'll post pictures of my four additional herb drawings when I get them complete. Today I had the day off from my day job (college professor) and taught a fun quilt class at my local quilt shop (Quilting Bits & Pieces in Eudora, KS). Teaching is just a great excuse for being able to to make a quilt twice! I love helping quilters see the simplicity and elegance of construction techniques that make the easy look complex. This wonderful pattern by Sandy Klop was featured in the October 2008 issue of McCalls Quilting. It is made using Moda's Jelly Rolls and is so easy to piece. The one I worked on today used children's fabrics, but the sample I did earlier for the shop was Mary Englebreit fabrics (pictured here). I love the pointed top and bottom, which was actually fairly easy to bind! The one I made today will be a baby quilt for my Nephew and his wife who are expecting in April. After my quilt class I scooted off to Lawrence for a pricey hair cut, then back home to get to my guild meeting by 7. One of our members presented a program of the antique quilts she collects. She had some lovely examples of 19th C. quilts and even a few 18th C. ones in chintz, wool, and silk. Wow, they were lovely. I have collected a few older quilts. Here is one of my favorite older applique quilts I purchased on ebay. I had an unusual request this week, to recreate a very old Keetoowah (Cherokee) Wampum Belt. The 7 sacred wampum belts of the Keetoowah are shown in the old 1916 photograph at right. This is the last time they were allowed to be photographed. The grandson of Redbird Smith asked me if I could make these out of fabric, after viewing my quilt exhibit at our Winter Faculty Art Show. I agreed, and today I made a wampum belt in the style of the smallest one on the left, hanging on the tent in the photo. It was awe inspiring to know that these very important, and very old traditional spiritual objects are still around, though I am told they are hidden away. In some small way, by re-creating these in a form that can be shown, I feel like I am participating in the survival of something very sacred. 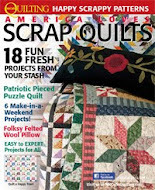 You just never know where quilting will lead you!! of the Keetoowah People and the laws from the Creator. Block #1 of Midnight Posies is ready! It is a simple nine-patch, but I call it a Nine-Patch Daisy. Each of the blocks in this series are familiar blocks designed to look like flowers by use of color, fabric, and texture. Make your own color selections or use the ones that I suggest. Either way this cheerful block will fill your winter with a little bit of spring. Hope you enjoy this quilt project. The French Bouquet quilt pattern on Flickr - Photo Sharing! 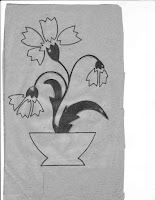 I love Grandmother's flower garden quilts and found a link to a copy of the original pattern for one version by Eveline Foland posted in 1931 in the Kansas City Star. I just love these vintage patterns. 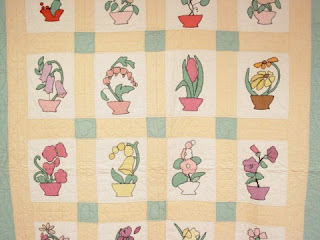 I recently purchased a set of original newpaper patterns for Eveline Foland's Flower Garden Quilt. I am working on developing a new pattern using these wonderful 80 year old blocks in an updated quilt. Here is a sneak peak of one of the patterns. And while I am on Flower Garden quilts, here is a picture of an *Amazing* flower garden quilt I recently saw at the Blue Valley Quilters Guild quilt show in Kansas City. I don't recall the quilter's name but her work speaks for itself! I am still learning about blogging so I may be asking for help as I try to post parts of this pattern. Have a great Friday the 13th! Today I noticed the first shoots of my garden poking up through the dirt. The promise of spring flowers always fills me with joy. What a perfect time to do a Flower Block of the Month to celebrate those tiny shoots. In honor of spring I will be offering one of my patterns, Midnight Posies, as a free Block of the Month and will post the first block very shortly. Here is a picture of the pattern. Hope you like it. This pattern is a great beginner project and is a wonderful "first quilt" for those who want a pretty small throw quilt with simple piecing. The fusible machine-applique border is super simple and is a great project for learning a few new techniques. Each block will be available for free for 30 days. After that, a new block will go up. The whole pattern can be purchased $12.00 if you don't want to wait a year to get all the blocks and the simple machine appliqued border. My newest pattern in my Charming Botanicals line is now published and will be available shortly. 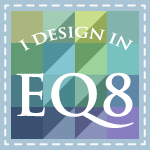 I am so pleased to be able to share my patterns with the quilting community. It has truly been a labor of love. To celebrate this, my 8th pattern in the Flower of the Month series, I want to share some of my patterns with you to thank all the folks who have inspired and encouraged me. Watch for free table runner patterns coming soon.